Harper supervises cataloging of the Ransom Center\'s photographic collections, from single prints to collective archives. 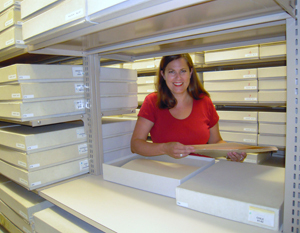 She works closely with both the Cataloging and the Photography Departments to determine processing priorities and assist with collection management. In October 1996, world-renowned photographer and author David Douglas Duncan donated his archive to the Harry Ransom Center. 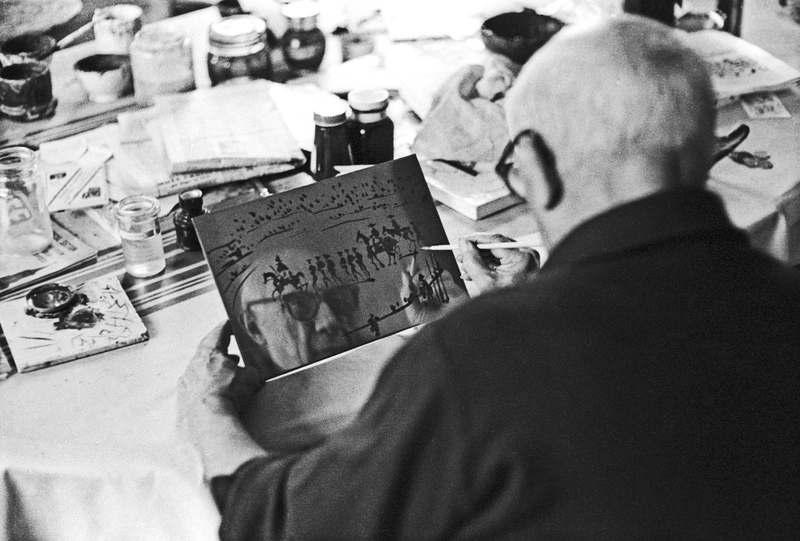 The Center has preserved, organized, cataloged, exhibited and made available a variety of images and artifacts that complete the archive, including many that document his years of friendship with Pablo Picasso. Recently, Duncan donated a plate painted by Picasso of his beloved dachshund named Lump. The new exhibition Picasso at Work. Through the lens of David Douglas Duncan, runs through September 25 at the Museo Picasso, Malaga, and will then move to the Picasso Kuntsmuseum Munster from October 15 to January 15, 2012 and finally at La Piscine Musee d’Art in Roubaix, France, beginning in February 2012. Ransom Center photo archivist Mary Alice Harper’s essay “The Nomadic Lens of David Douglas Duncan,” featured in the exhibition catalog, has been published in English and Spanish by Museo Picasso Malaga, in German by Hirmer, and in French by Gallimard. Below is an excerpt from Harper’s essay. The girl [Jacqueline] came down. Maybe thirty, black slacks and pullover… and wonderfully friendly. I’d thought that she might be the protective guardian type. Told her why I was there, and gave her the ring for Pablo P. She went upstairs, two at a time. I looked around. The place was jammed with crates, boxes, bronzes, cartons, barrels… they had been in the place for around half a year—not a single piece of furniture. Nothing! She came downstairs, grabbed me by the hand and up we went. No furniture. Whizzed through a series of corridors and rooms, followed a black electrical connection cord… into the bathroom, and there he was—cheerily lathering himself, in the tub! It was perfect! Pablo Picasso without much question, the greatest living artist of our century, black eyes dancing, warm and safe and wringing wet, in his bathtub. In went the ring, soap and all. She went on scrubbing his back… which she’d been doing when I arrived. Picasso and I talked in Spanish, she and I in English; I must have seemed naked, too, without my camera so he told me to get it, that the pictures, if I wanted them, might be interesting, since this was one place where no one had ever nailed him. From that moment on we had one of those times that I really shall treasure. After she dried him off and he pulled on a heavy bathrobe, we went into the next room… no furniture… where he got his glasses, and my magnifier, and then really looked at his ring… After carefully examining the stone, and carving… “What instrument could the man possibly have used?”, sort of a query to himself. Best of all he understood the reason why I gave it to him and accepted it exactly as intended. I feel that it delights him. We went downstairs. The front three rooms… only two tables, crammed with things he has made, painted, turned or twisted into life… The place was mine. Picasso and Jacqueline simply took me in as a third member… fourth, counting that boxer… Possibly it was an exceptional day, but he radiated one extraordinary quality… youthful exuberance; a child’s direct, intense feeling for the impact of those moments that we remember through the remainder of our years. This man still has it. Photographic Archivist Mary Alice Harper works with the Magnum Photos Collection. Photo by Linda Briscoe Myers. As is the case with any incoming collection, the Magnum Photos collection came with its own unique set of challenges. Ransom Center Curator of Photography David Coleman and I have worked to develop and implement a strategy for making the collection accessible to researchers in a timely and organized manner. The agreement between MSD Capital, the owner of the collection, and the Ransom Center places the Magnum collection at the Center for at least five years and stipulates the photographs be made available. Desiring to open the collection as quickly as possible, the curator and I devised a two-phase approach for cataloging it. The first phase was to translate Magnum’s original, complexly coded spreadsheet into a standardized preliminary box-level inventory. Working with Magnum’s archivist, Matt Murphy, I organized the materials in such a way that the arrangement reflects Magnum’s various filing systems and simultaneously unites them. As a result, the materials are divided into the following five series: Photographers (photographs by Magnum photographers); Personalities (photographs of persons of note, from movie stars to world leaders); Subject (a broad selection of topics designated by Magnum); Geographic (photographs arranged by geographic location); and Magnum (photographs of Magnum photographers, agency staff, newspaper clippings, and non-Magnum photographs used for special projects). The Personalities series of the original spreadsheet provided only name ranges for these boxes (e.g., Rodgers to Roosevelt). So throughout the spring, Jillian Patrick, an undergraduate student at The University of Texas at Austin, meticulously listed the personality’s name on each folder contained within the 200 boxes. Assistant Photographic Archivist Nicole Davis and I then spent more than one month editing that list and entering the Library of Congress’s authorized form of each personality’s name when available. When not available, we devised name forms according to the second revision of the Anglo-American Cataloguing Rules. This proved challenging, given the creative spelling and reverse order of various names found on Magnum’s folders. All original folder headings were maintained in the inventory, but references to the authority form of each name are also provided. With the six-month anniversary of the collection’s arrival fast approaching, I converted the preliminary inventory into Encoded Archival Description, making it fully accessible and searchable online. The name authority work for all personalities is not complete, but 84 percent of the boxes are currently listed at the folder-level in the online version of the preliminary inventory. In the coming months, a revised version of the finding aid, with the Personalities series completed, will be posted online. In January, I hope to begin the second phase of cataloging the collection, which should take 12 months. The end result will be a detailed archival finding aid and a searchable database enabling researchers to locate all prints by any photographer in the collection.